Price examples of conference packages and meetings etc. Exclusive meeting rooms with a fantastic view over city and strait. Our package deals include meeting space, meeting host, delicious food from the restaurant BON ICI and all the technology needed for a successful meeting. Welcome to a serene meeting place in the heart of the city! We are proud of our facilities and are more than happy to show them to you. Please feel free to contact us with your request! Create a real high-profile event! Mixer for customers combined with a mini fair or a nice gathering for coworkers? 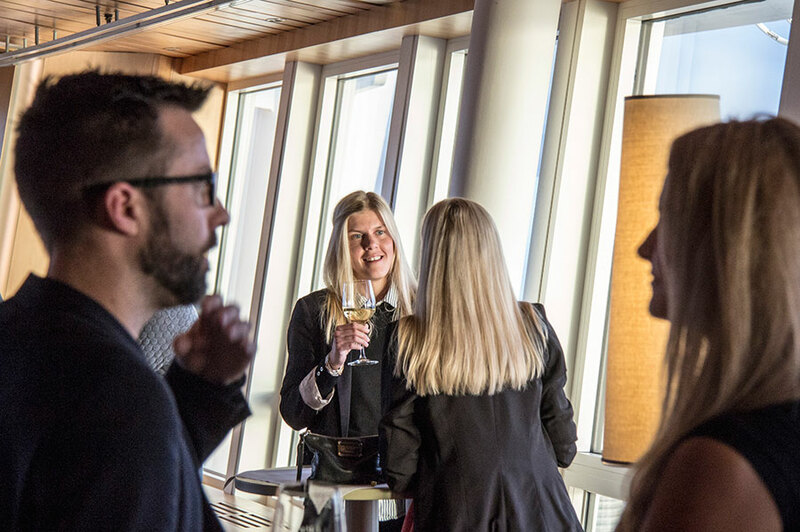 You will mingle and enjoy a tasty buffet of appetizers while overlooking the majestic view over Malmö. Of course you can get married 179 meters above sea level at Turning Torso. Book a private showing of Turning Torso. Jan Andersson, also known as Mr. Turning Torso, will take you on an exciting adventure inside the building. Price: 180-350 kr/person depending on the number of participants. All prices are for the year 2016, given in SEK and do not include VAT unless otherwise stated.